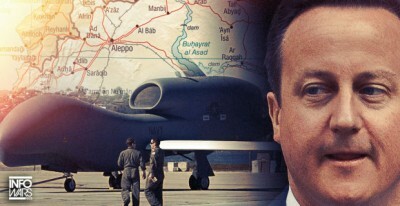 500 Days of British Drone Attacks in Iraq and Syria, « Against ISIS » or « Against Civilians »? Overall this indicates that one-third of British air strikes against ISIS have been carried out by drones, however this masks a very recent change. For the 12 months from November 2014 (when first UK drone strike against ISIS took place) until 31 October 2015, UK Reaper drones carried out 49% of strikes (191) while UK Tornados carried out 51% of strikes (202). In the four months since October 2015, when additional British Tornados and Typhoon aircraft were deployed and there was a surge of strikes in Iraq around Ramadi and Mosul, Reapers have carried out 76 strikes (19%), Tornados 197 (49%) and Typhoons 130 (32%). So while it may look as though the use of British drones to carry out strikes has declined, in fact the monthly average of British drone strikes has actually increased in that four month period from 16 per month to 19 per month (see table). There are also signs that the ‘surge’ in strikes by Tornados and Typhoons in Dec 15/Jan 16 has diminished. According to the MoD updates (up 1 March 2016) there have been 54 British air strikes in Syria out of a total of 338 UK strikes since the December 2nd vote to extend military action into Syria. Despite David Cameron’s insistence that the UK had to “crush the head of the snake” by bombing in Syria and Michael Fallon’s argument that it was “morally indefensible” not to bomb in Syria, just 16% of British air strikes have taken place there in the three months since the vote. This is likely due to the fact that finding targets for strikes – when the US and others have already been bombing for more than a year – would be very difficult, as was clear for some time before the vote. About half of the 50 or so British strikes in Syria have been against oil infrastructure – or engineering vehicles to fix damaged oil infrastructure – with the rest against ISIL positions, checkpoints and fighters. The Ministry of Defence (MoD) continues to insist that there is no evidence that any civilian has been killed or even injured in the 500 days of UK drone operations – or indeed in the 800 air strikes in which more than 1,000 weapons have been fired by British drones and aircraft. Airwars, the independent group which monitors air strikes in Iraq and Syria argues there is fair evidence of between 918 and 1,278 civilian non-combatants killed in 144 separate incidents. The organisation recently wrote to the MoD about 8 British strikes that took place in December 2015 after cross-referencing of reported civilian casualty incidents with UK airstrikes had indicated possible concerns. The MoD responded that no British aircraft were involved in the strikes in which civilians were reportedly killed. Despite the British insistence of zero civilian casualties, and US statements that only around 20 civilians are “likely to have been killed”, hundreds of civilian on the ground have been killed and injured in Coalition air strikes. A browse through the names, photographs, videos and details of civilian casualty reports compiled by Airwars during 2015 should give serious pause for thought to those all to ready to accept official claims. While today marks 500 days of British drone operations in Iraq and Syria, the UK’s drones were deployed directly from operation in Afghanistan. In fact Britain’s Reaper drones have been engaged in permanent military operations now since October 2007, almost eight-and-a-half years. And there appears to be little sign of British drone operations coming to an end any time soon, in fact just the opposite. Last autumn David Cameron announced his intention to double the UK’s drone fleet again (renaming the Predators as ‘Protectors’) as well as purchasing the extremely long endurance Zephyr drones. And yesterday David Cameron announced £750m of further funding for the Future Combat Air System, a joint UK-French combat drone demonstrator programme. It has long been argued that the remote, so-called ‘risk-free’ nature of drone warfare will lead to a permanent state of war. Today’s milestone seems to be just another step on that long journey.